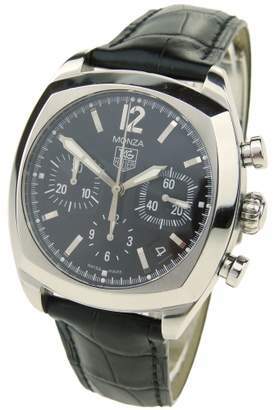 This pre owned Tag Heuer Monza stainless steel wristwatch on a leather strap with deployment clasp is overall in excellent condition with some minor marks to the case and strap. Featuring a black dial with black sub dials with silver batons, this is the CR2113. FC6164 model. The 37.5mm squared case houses an automatic movement with date and chronograph functions which has been thoroughly checked by our experienced onsite watchmakers and is in full working order. The watch comes with Tag Heuer box, undated warranty card and instructions, along with our Parkers 12 month warranty. TY5704 ALL VIEWINGS ARE BY APPOINTMENT. Please call 0114 2343365 or email contact@parkersjewellers. co. uk with the SKU reference number of the watches you would like to view.